Now one couple, Terry and Christine Haycock, are testing how far the Strasbourg Court will go to protect their property rights in this fracas (which would be under Article 1 Protocol 1). They thought they had planning permission to build their home from Albox council but now that is being disputed by regional government. 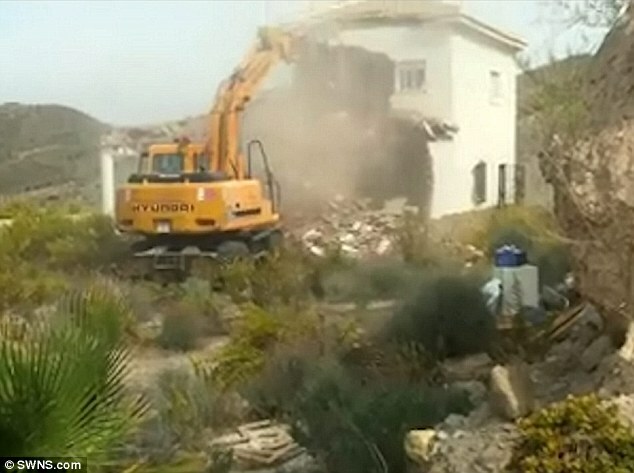 In September 2013 they won a stay of execution for the demolition order when they notified the Spanish court that they had petitioned Strasbourg. No doubt the Spanish government will challenge the admissibility of their petition. Under Article 35 (1) of the Convention the Strasbourg Court may only deal with a matter “after all domestic remedies have been exhausted, according to the generally recognised rules of international law”. The obligation to exhaust domestic remedies is designed to afford the national authorities, primarily the courts, the opportunity to prevent or put right the alleged violations of the Convention. It is based on the assumption, reflected in Article 13, that the domestic legal order will provide an effective remedy for violations of Convention rights. In the Haycocks’ case, they can be expected to have done no more than seek a stay of execution from the local court. As the Court’s own Practical Guide on Admissibility Criteria states, when one remedy has been attempted, use of another remedy which has essentially the same purpose is not required (Riad and Idiab v. Belgium,§ 84; Kozacıoğlu v. Turkey [GC], §§ 40 et seq. ; Micallef v. Malta [GC], § 58). It is for the applicant to select the remedy that is most appropriate in his or her case. Since it has proved so difficult to obtain compensation from the developers and public officials – many of whom are serving prison sentences for corruption – it is highly unlikely that the Haycock’s case will be barred on this threshold issue. Whether the Court will go so far as to hold the Spanish government accountable for the fraudulent misrepresentations of its civil servants and its failure to squeeze compensation from development companies is a matter for speculation. The fact that the existence of a petition to the Court has been enough to stop the bulldozers in their tracks must be of considerable comfort to other homeowners (not just British) in the Haycocks’ position. If a measure is alleged to be contrary to a Convention right, and its effects are irreversible, such as a demolition order, then the requirement under Article 13 for an “effective” remedy can suspend the execution of that measure. This particular aspect of Strasbourg’s influence has attracted a certain notoriety with politicians in expulsion cases, Al Qatada being the most recent example. But Strasbourg may find that its intervention is less unwelcome domestically in the Spanish holiday home crisis. If, that is, it is prepared to square up to the obvious unfairness of the situation and to find a violation of the right to peaceful enjoyment of possessions which has no public interest justification, even in the current fiscal crisis that beleaguers that country. Transforming Strasbourg’s A1P1 approach to property rights? The ECHR will ignore the guidance above: ‘Applicants are only obliged etc’. So thrre will be no joy for these white English people in Strasbourg. This could be Spain attempting retaliation against the British Expats over Gibraltar. This is one of a number of actions Madrid is taking to place pressure on both Britain & Gibraltar. There has never been a better reason to pull out of Europe if the EU Commission fails to punish Spain for the border delays or the demolished houses. Indeed, the British Government ought to veto any aid to Spain over their growing economic problems, whilst assisting the Catalans and Basques to seek separation from Madrid.